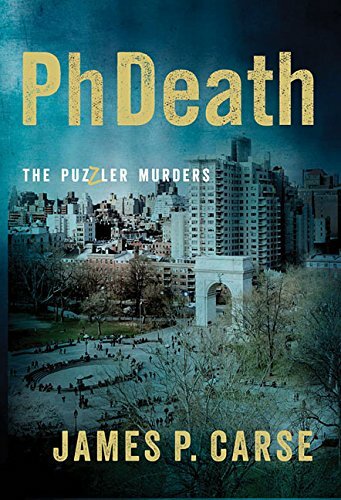 Amazon.com description: Product Description: ÃPhDeathÃ is a fast-paced thriller set in a major university in a major city on a square. The faculty finds itself in deadly intellectual combat with the anonymous Puzzler. Along with teams of US Military Intelligence and the city's top detective and aided by the Puzzle Master of ÃThe New York TimesÃ their collective brains are no match for the Puzzler's perverse talents.ÃCarse Emeritus Professor himself at a premier university Ã¤ in a major city on a square Ã¤ shows no mercy in his creation of the seemingly omniscient Puzzler who through a sequence of atrocities beginning and ending with the academic year turns up one hidden pocket of moral rot after another: flawed research unabashed venality ideological rigidity pornographic obsessions undue political and corporate influence subtle schemes of blackmail the penetration of national and foreign intelligence agencies brazen violation of copyrights even the production and sale of addictive drugs. About: ÊPhDeathÊ is a fast-paced thriller set in a major university in a major city on a square.